can provide the perfect leisure living house plan. Select a house plan concept and receive a no-obligation FREE Cost Estimate tailored to the area where you intend to build your new home. Learn more about how you can get started today. Topsider's unique Post & Beam construction has no load-bearing walls so the design possibilities are limited only by your imagination. Choose from over 250 online house plan concepts. Topsider's coastal and island homes are designed to withstand high winds, storm surge and salt-air coastal climates. Whether a piling, stilt or pedestal home, each Topsider Home is designed and pre-engineered to the highest structural standards. quality custom homes to Hawaii for over 40 years. Topsider's Hawaii Homes are custom designed and unique to their locations, views and the owners' preferences. 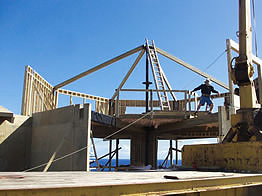 Our unique elevated pedestal home foundations are ideal for Hawaiian mountainside building. Each Topsider Home is custom-designed and pre-engineered, then fabricated in our state-of-the-art factory and shipped in component form for easy assembly by local Hawaii home builders. As part of our services package, we recruit and pre-screen local builder candidates and scrutinize their construction bids. We take the technical lead for engineering, permitting and approvals and provide ongoing technical support as well as logistical and construction coordination throughout the project. 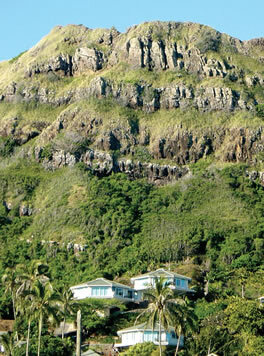 Steep Hawaiian terrain and challenging building sites like this one at Kailua, Oahu, have been Topsider's specialty for more than four decades. 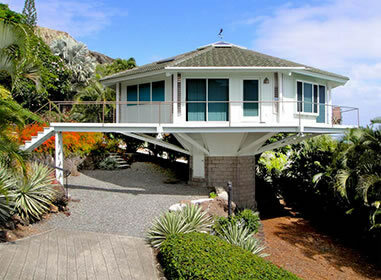 Topsider Homes custom designs our Hawaii houses to take full advantage of the fantastic views. With its varied topography, soil conditions and climates, building codes, and all the other issues of new home construction, Hawaiian home building can be complex, particularly for those who live elsewhere. We understand these challenges, and our experience allows us to deal with them. It’s what separates Topsider from other new home construction choices in Hawaii. Building your new Hawaii home is about lifestyle and enjoying the natural surroundings that are unique to each of the Hawaiian Islands. We design every Topsider Home so it blends with the natural terrain and is architecturally appealing from the outside and a unique living experience inside. We design open living floor plans and lanais - and most importantly we orient each home to take full advantage of the beauty that Mother Nature provides. 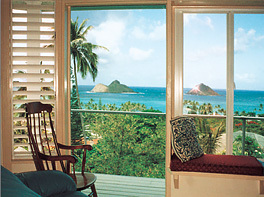 We know that being able to enjoy the magnificent Hawaiian scenery is the key to island living. The smooth flow from inside to outside with ample decks and lanais is what makes living in Hawaii unique. And our typical floor-to-ceiling windows and sliding glass doors make this transition seamless. 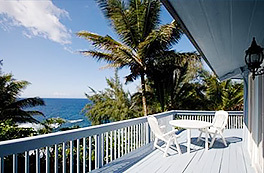 Living in Hawaii is all about the breath-taking scenery and views as with this home near Pahoa. Topsider Homes range in size from small home designs under 500 sq. ft. to large luxury homes approaching 20,000 sq. ft. Some are on one level and others two or more stories in height. We show more than 250 online house plan concepts in various collections to provide a starting point from which to work for design and budgetary considerations. Once prospective clients select a house plan concept, we will provide a Free Cost Estimate which will provide an idea of what this home's built costs are likely to be. Click HERE for online plans. The right building materials such as treated lumber, galvanized and stainless steel fasteners, together with siding materials impervious to insects & the tropical climate make this Kauai house low-maintenance. tation for the best views. 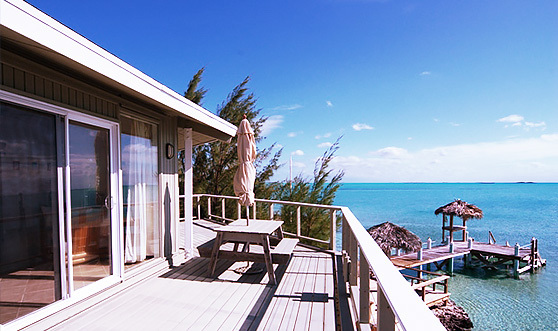 All Topsider Homes going to Hawaii have a post and beam structural skeleton of steel columns and large laminated timbers held together by massive galvanized steel couplings and bolts. Attached to this structure are 2x6 framed panelized roof, wall and floor panels made of treated lumber and plywood which are nailed with stainless steel fasteners. 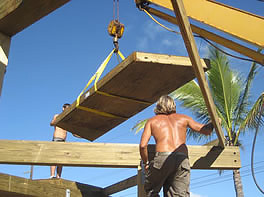 Each Topsider Hawaii house kit has a wood and steel post and beam framework for strength and durability. 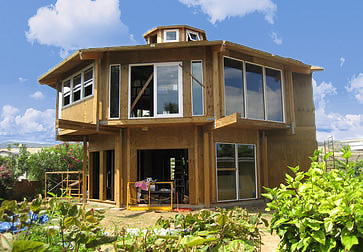 Topsider’s Hawaiian prefab house kits include pre-engineered 2x6-framed panels for walls, floors and roofs. Foundations are designed based on many factors such as terrain, soils conditions, elevation requirements, views, etc. Topsider offers many different foundation types, including pedestal home foundations for severely sloping topography and terrain, post and pier foundations, stilts and pilings, along with more traditional slabs, raised slabs, crawl-spaces and basements. Whether you plan to build your new Hawaiian home in a rainforest on the Big Island or in a remote location on Maui - or even in urban Honolulu, Topsider Homes has the expertise and experience.